Mastrio Web Page » The Archive » Hi, I’m #7! It’s one of those things that your really can’t explain, so I’m not going to try to do it here, but just let you know about something I think is pretty cool. Recently, my niece informed me that my Myspace account’s song thingy had been deleted by the artist that had posted it. The artist is Dada and the song was “Crumble” – one of my favorite songs by them. This was good, that meant they had updated their Myspace profile! So, I went out there to check it out. To my delight, I found out that they are going to be playing two dates on the east coast in August: Virginia and Philly! That was good news, perhaps I’ll organize a roadtrip with my wife and some bandmates and make it a fun overnight trip. Now for the really fun part – as I’m scrolling down the Myspace page, I happen to notice this really good looking guy in their “Top 8” friends… can you guess who? YEAH, IT’S ME BABY!!! I guess a big “thank you” is in order, because being a huge fan and being acknowledged (for some unknown reason) is a cool thing. My friend Brian was mentioned in the liner notes of their “how to be found” CD, now that’s immortality! 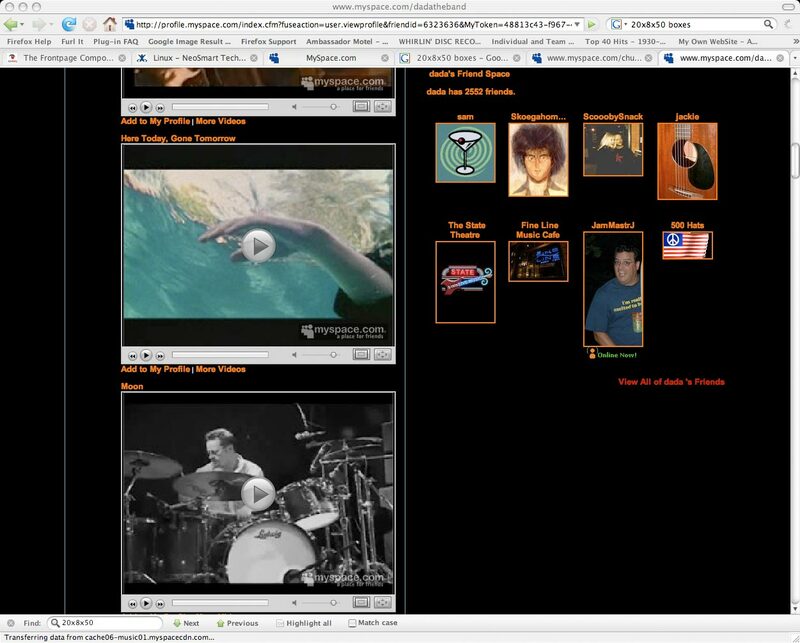 For now, I’m happy to be #7 on their Myspace page… here’s a picture of it to remember it by, just in case i’m “here today, gone tomorrow” (it’s a dada tune, just in case you didn’t already know that). Excuse me, I have some work to do . . . Sting has a MySpace page too!